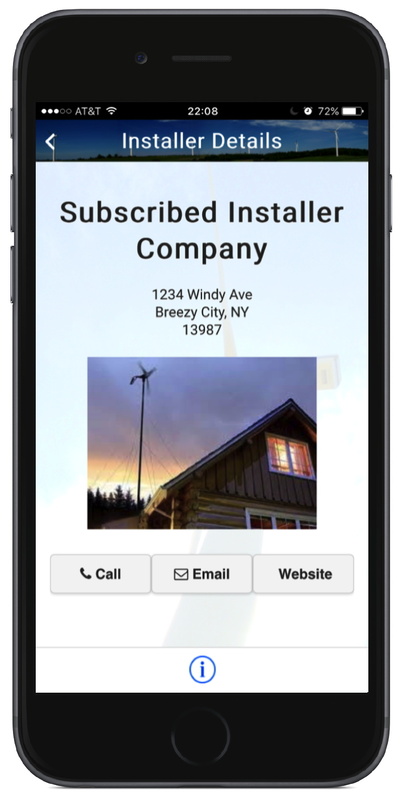 Thanks for your interest in becoming an Installer member of the WindApp community! Installers can setup and activate their full profile, which includes email, website, direct phone links and a company logo, for the annual subscription fee of $75. Once ERA receives your information, your data will be uploaded to every WindApp user and available at their next launch. Fill out the fields below, so we can update and add your full profile to the app. Then send us your info. Your data is uploaded to all WindApp users the next time they launch the app! Once you you have received the upload 'Thank-you" confirmation on this page, simply click on the PayPal button and complete your purchase. Please fill out the additional fields below so we can add your full profile to the app. The annual rate for an Installer on WindApp is $75. The Subscribe button below will take you to the PayPal site where you can pay with your credit card. You do not need to join PayPal to subscribe. Please first upload your company information in the form to the left.